Back in May I spent an afternoon filming with Yellow Duck Productions for their hit BBC Wales genealogy series, ‘Coming Home’. 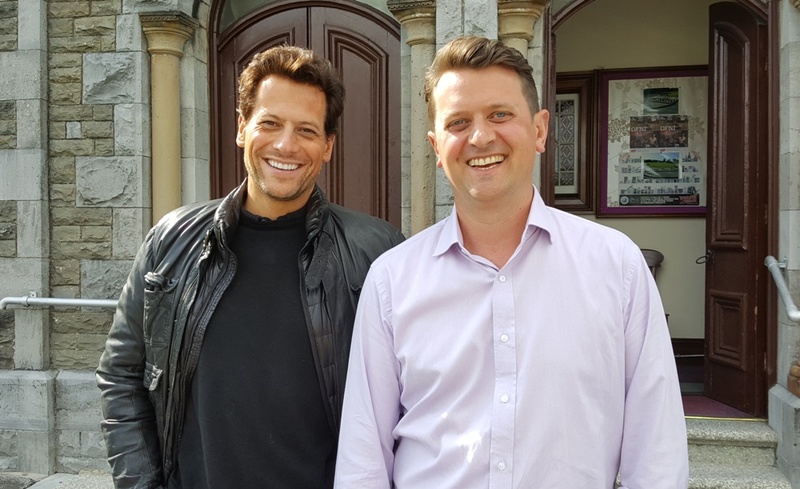 The programme, which was shown on at 9pm on BBC One Wales on Wednesday 21 December was an hour-long special, looking at the family history of Hollywood actor Ioan Gruffud. Whilst it unlocked stories of Ioan’s royal connections it was his Great Great Uncle Rees (known as Rhys) Griffiths’ service in the Great War which I had been asked to research and explain. Rhys was the son of David and Anne Griffiths, of Meilog, Pontyberem. A keen churchgoer, at the outbreak of war he was studying to enter the ministry. 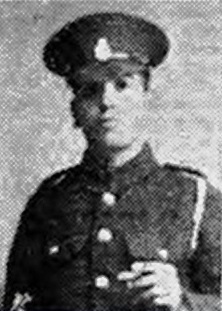 He enlisted at Carmarthen in the Royal Army Medical Corps (RAMC) and was posted to 106 Field Ambulance, part of the 35th Division (made up of ‘Bantams’ who were all under the normal regulation minimum height of 5’ 3”). With his unit, he moved to France early in 1916, occupying positions in the trenches in French Flanders and Artois. Sadly, there is no surviving service record for Rhys and so his day-to-day movements can only be pieced together from his unit war diary. The war diary for 106 Field Ambulance is often short and functional, describing the routine of the subsequent months with little elaboration but noting issues involving latrines, dung heaps, a lack of coal for hot baths and too few disinfectors to help prevent scabies and lice. At the end of May 1916 this period of relative calm ended abruptly. 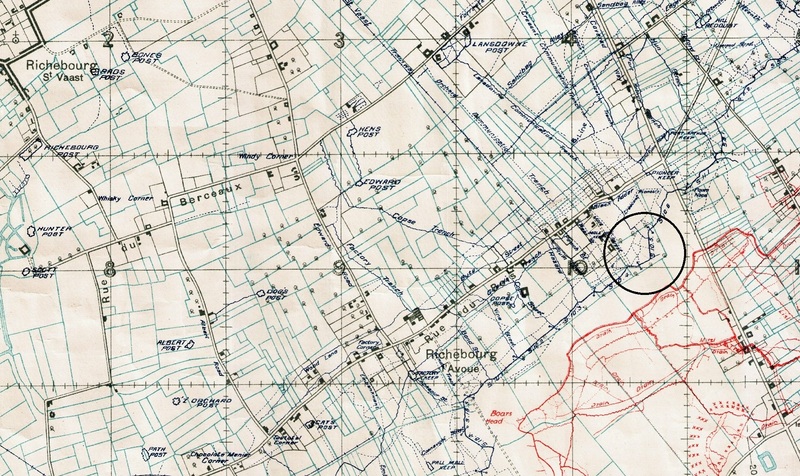 On the night of 30 May 106 Field Ambulance are serving in the Rue du Bois sector between the villages of Neuve Chapelle and Festubert. At this time these villages, both heavily fought over in 1915, were considered a relatively ‘quiet’ sector. At 7.20pm that night a heavy German bombardment falls on the frontline trenches around the salient around S10.5, destroying 250 yards of breastwork trenches. Further artillery fire falls on support positions, ‘bracketing’ the area and preventing British reinforcements getting through. Under this bombardment the infantry holding this sector, W Company of 15th Sherwood Foresters, suffer heavy casualties and it is reported three officers are wounded. One of these, Captain Ralph Ainsworth is wounded twice. The barrage is a precursor to a highly successful raid by the enemy. By 8.40pm, with positions destroyed and most of the Sherwood Foresters wounded, German troops attack, penetrating the right flank of the position and taking a number of men prisoner. By 10.10pm men of the 14th Gloucesters and 18th Lancashire Fusiliers had re-established British control of the salient. Dear Mr Griffiths, I have to break the sad news to you of the death of your son, Rhys, on the night of 30 May. In the bombardment of the trenches there were many wounded, and he and his friend, Dugdale, were together giving first-aid and carrying the wounded back to safety. As I understood it was while Rhys and Dugdale were attending the wounded officer that a shell burst which killed Rhys, but left Dugdale unharmed except for a severe shock. When he is well enough he will be writing to tell you about it. But there is no doubt that Rhys showed great bravery, and thought not of himself in his noble devotion to duty. I knew him and loved him. He was known to be a splendid comrade and a true Christian. Often he would sing to us his Welsh songs and hymns. The German raid was very well planned and executed. Raids such as this were a common enough event, even in ‘quiet’ sectors. Their usual aims were to kill the enemy, gather intelligence on defences and, if possible, capture prisoners who could be interrogated for additional information. A report written the following day by Lt Colonel RNS Gordon, 15th Sherwood Foresters details two Officers and thirty-four Other Ranks still unaccounted for. A subsequent report provides a detailed narrative of events and lists Officers and men who showed gallantry during the raid. First on the list is Captain Ainsworth (the twice wounded officer) who the report describes as ‘although wounded twice refused to be moved and stayed with his Company until the end. He displayed remarkable coolness and apparently only gave the orders to withdraw to the flanks as a last expedient. He further took steps to see that all documents and the logbooks were sent to Headquarters on realizing the gravity of the situation. In fact, he stayed missing – at least to the British. 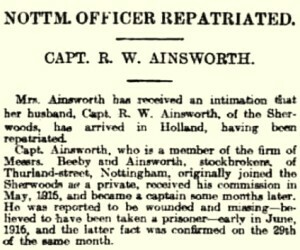 Records show Captain Ainsworth was captured by the raiding party. He was held by the Germans in Officers’ Detention Camps at Crefeld and Holzminden until April 1918, when he was transferred to Holland, finally being repatriated in December of that year. Notification of his transfer to Holland reached the Nottingham press on 22 April (shown to the left). A Facebook page ‘Small Town, Great War. Hucknall 1914-1918’ gives more detail on Captain Ainsworth here. As the chaplain’s letter describes Rhys and Dugdale attending a wounded officer when Rhys is killed, there is a good chance the officer was Ainwsworth. The letter also describes Rhys’ RAMC comrade, Private Robert Dugdale, being severely shocked. Dugdale’s pension record survives and confirms the chaplain’s description of events. He was admitted to the Field Ambulance as a casualty that night, suffering with neurasthenia. Dugdale makes a full recovery, serves through the Somme, Passchendaele and the 1918 battles, ultimately surviving the war. 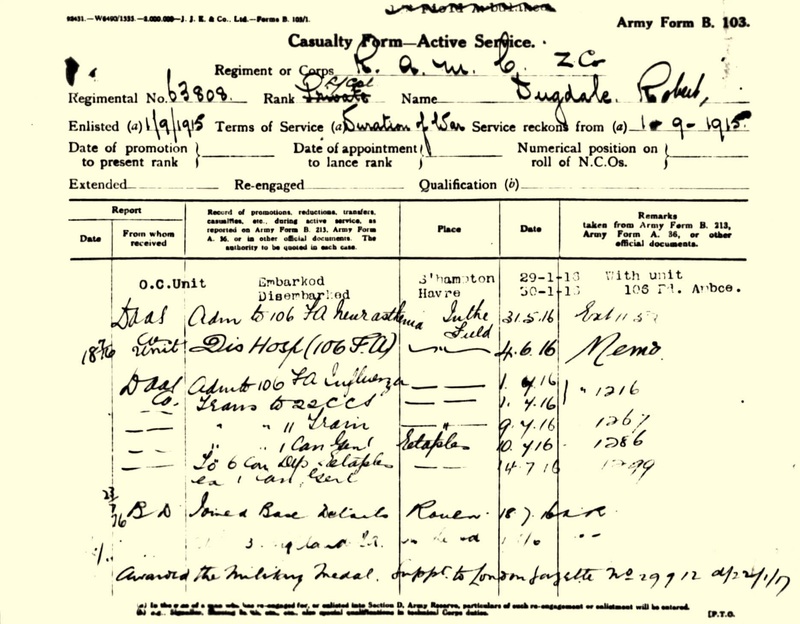 Having served nearly four years he was discharged in July 1919. Dugdale was awarded the Military Medal in January 1917, probably for good work during the Battle of the Somme. 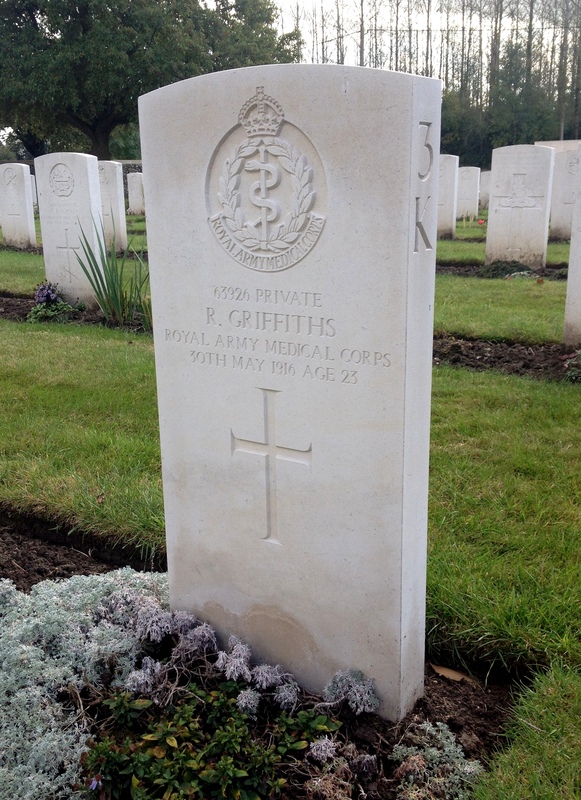 Rhys Griffiths was the first death suffered by 106 Field Ambulance since their arrival in France. The other two men known to be associated with his death, Private Robert Dugdale and Captain Ralph Ainsworth, both survived the war. Such is the way luck can play a part in surviving time in the trenches. Despite it being a tragic story, it was a satisfying experience to talk Ioan and his father Peter through Rhys’ all too brief period of time on the Western Front. Another family now aware of their link to the Great War. Rhys is buried in St. Vaast Post Military Cemetery, Richebourg L’Avoué alongside the men of 14th Gloucesters and 15th Sherwood Foresters who also died on 30 May 1916. Remembering them all.